The Three Rs: Rants, Raves and (Occasional) Reflections: Not-So-Little Goose Lost? This Canada goose showed up all alone at the mall near our place a few weeks ago. At first, we thought he was injured--but he seemed all right and had a healthy appetite. As you can see, he's certainly not shy! He not only cheerfully accepted food from people waiting for the bus, he was only too happy to let Collin take his photograph. I contacted the World Bird Sanctuary, but was told they only work with birds of prey. They referred me to a wild bird rehabilitation group. 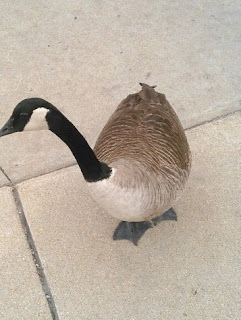 But by that time, our feathered friend had tired of life at the mall and moved on. Or so we thought. The other day, we were out and about...and spotted what I believe to be the same goose, all alone near the Metrolink station in Shrewsbury eight miles away. Normally, in fall and winter there are maybe a hundred geese at that spot along the River des Peres (a rather fancy name for a large combination sanitation and storm sewer). Monday, there was just one. Makes me think of Igor in the movie Fly Away Home. I hope he got better and was able to fly. As of Monday, he was still hanging around. He has to be able to fly, because there's at least eight miles between the mall where we first spotted him (her?) and the Metrolink station, where we saw him on Monday. Amazing that he was still hanging around. Might be tired. Many of them come all the way South and hang out with golfers all winter then go home. It's been kind of chilly even down here compared to years past and I know it's cold where you are. Maybe he thinks he's in Canada? I think climate change has confused a lot of creatures. Some geese do stay here all year round, but I've never seen one alone before. It's been pretty warm here this past week. He must be able to fly- maybe he's decided to hang around. Or maybe he's holding off, thinking he'll wait until it actually warms up. Sounds like he may have an injury Norma, hopefully it'll heal and he can catch up with the flock at some point! He seems okay, and has a very healthy appetite. He's also quite friendly, which worries me. When Collin was very young, we used to take him to a park near our house. There were ducks there, and they became accustomed to us feeding them. Then they started disappearing, one by one. My guess is that they ended up on someone's dinner table because we inadvertently made them easy to catch. Oh no! That does seem a little suspicious hey! He makes me think of Igor in Fly Away Home. He couldn't fly but was otherwise healthy, so he got to ride to North Carolina from Canada in the ultralight. It's a classic. It'll never be discontinued! I would be very worried about him. Too many cruel people out there. Love love love Igor, Fly Away Home is such a sweet movie. Norma, you would be a great goose mommy! Sounds to me like someone (plural) is already feeding him! But if you adopt him, look out for the poop! Geese make lots and lots of poop! I saw something recently where some people adopted a goose. The goose lives in the house with them. He is said to be affectionate and a cheerful companion. Alas, they were unable to house train the goose. He must wear a diaper. Gayle: I love Fly Away Home. And this guy does remind me of sweet Igor. Shelly: I'll take that as a compliment! Cheryl: Our property manager never charged us a pet deposit for Sam...but I think she might object to a goose! Lynn: I remember actor Jack Palance had the same problem with his pet turkey! Canada geese don't need to migrate in the way we think. We have geese up this way all year around. As long as they can get food--their main choice seems to be grass. Yes. Just everyday lawn will do. This fellow obviously knows a good thing when he has it. He's getting handouts. Why not stick around for them? Moving him would only be a waste of time. He'd come right back to where he knows he's got a meal ticket. He does seem to be enjoying himself! They seem pretty aggressive where food is concerned. I used to go to a pond to feed the ducks when my kids were little. If Canadian geese were around, they'd get out of the water and come right up to me! Hope he recuperates soon if he's injured. He/she seems very good-natured. I suppose that could change, though, if anyone shows up without food! I'm happy to report that our lost goose has been reunited with his goose peeps!